Go to Lynda.com and you will find about a thousand testimonials from satisfied customers around the globe who have benefited from the site’s online digital media training. Read through a few and you realize that this virtual learning hub has such a thankful following because it empowers its customers and changes their lives. People like Jacques D., who reported winning a contract for a job after using Lynda.com to take a “crash course” in a software program required by the client. “I got the work the next day!” he exclaimed. Lynda.com—the culmination of the past 13 years of her work—has evolved from a site that originally offered ten video courses online to one that now boasts hundreds more, on a broad range of software and subjects from After Effects to XML. To keep pace with emerging software and technology, new titles are constantly added to the growing line of teaching materials, with topics for beginners and professionals alike. At press time, the site offered 416 courses, each taught by instructors who are not only proven experts in their fields, but also clear communicators and good teachers. Need to know how to do something in Dreamweaver, Photoshop, FileMaker Pro or any of hundreds of other programs? For $25 a month or $250 a year—a bargain in the computer training arena—subscribers to Lynda.com’s Online Training Library have unlimited access to any and all of the more than 28,000 QuickTime video tutorials on an ever-proliferating number of software and design topics. “It’s all-you-can learn training,” says Weinman. Weinman didn’t set out to do what she’s now doing. In fact, she describes her livelihood as “one gigantic, happy accident.” She completed her studies in humanities at Evergreen in three years, having never touched a computer (the first mass-market personal computers were not available until the late 1970s). After graduation, she headed back home to California. At age 23 she opened the first of two shops she owned in Los Angeles. Both were named Vertigo, after her fondness for the influential director Alfred Hitchcock’s movie by the same name. In 1982, she left the retail business, initially pursuing a career in special effects and animation after being introduced to the film industry by friends working in the field. She became an animator and a motion graphics director, working on such films as Star Wars Episode VI: Return of the Jedi and Bill & Ted’s Excellent Adventure, and directing music videos for Lyle Lovett and Howard Jones. Weinman launched her first Web site in 1995 to promote her graphics work and to enable her design students to check on assignments. I hope people don’t put me on a pedestal. I’m really just a student of this stuff myself, who loves to pass on what I learn to others. It’s not about me at all, it’s just something that bears my name that I started, but it’s the culmination of something so much bigger than myself. Thinking her students would also want to learn the new technology, she searched for a suitable textbook on Internet design. Finding none, she decided to write one herself. Her book, Designing Web Graphics, is credited as the first industry book on Web design, but it came out originally as magazine article installments because she was unable to find an interested publisher. The publishing world soon realized there was a demand for the subject, and when the book was finally published in 1996, it became an immediate hit. Now in its fourth edition, it has been translated into dozens of languages and is considered a classic in the field. The book’s success put Weinman in great demand for speaking and teaching engagements, which took her away from her home in Ojai, Calif., and her young daughter more than she wanted. Her husband believed students would come to her, so they rented a school computer lab and scheduled her first class. It was a sell-out, with one woman flying in from Vienna, Austria. “That’s when we realized the reach of the Web,” Weinman says. She moved the classes entirely online in February 2002. Since then, hundreds of thousands of students have signed on for training. Weinman helps to shape course content and teaches some courses, along with dozens of other instructors who are experts in the topics they teach. Last year, she moved the business, and her residence, to Ventura, Calif., where she employs 85 people. Weinman has established herself as a leading voice in Web design. She has written 15 books and has her own imprint, called Hands-On Training (H.O.T. ), with Peachpit Press. She has worked as a consultant for Adobe, Apple, and Microsoft, and has conducted workshops throughout the world. She has been a keynote speaker, moderator, and lecturer at numerous design, animation, Web design, and computer-graphics conferences. She also co-founded the Flashforward Conference and Film Festival, the largest Adobe Flash conference in the world, in 2000. 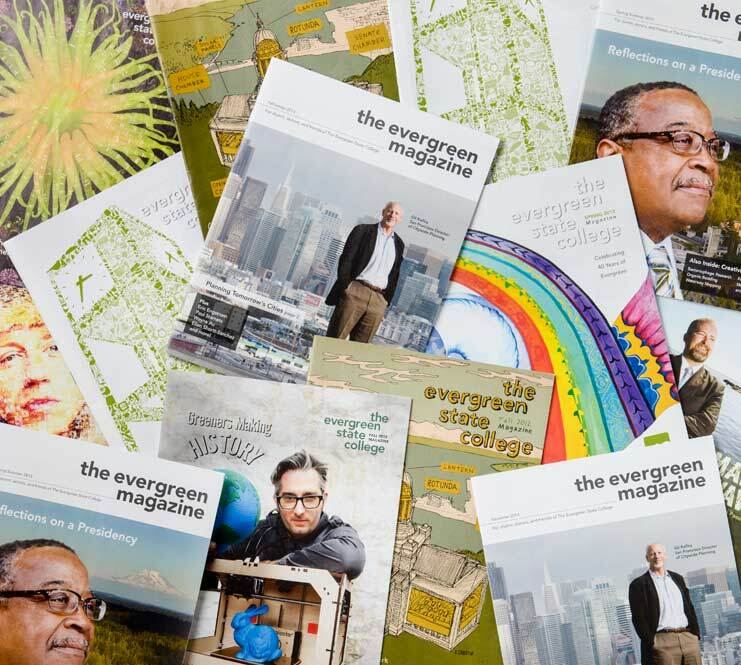 Weinman gives Evergreen a great deal of credit for her success—and for her approach to teaching.